The Miami Rental Car Center and the MIA Mover, completed in 2010 and 2011, respectively, are the first two components of the Florida Department of Transportation’s Miami Intermodal Center (MIC) project, slated for total completion in 2014. 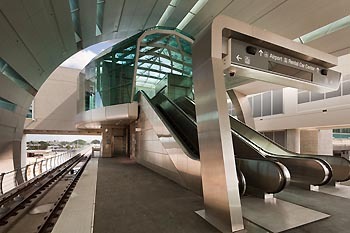 AirportLink, a 2.4-mile extension from the MIC to Miami-Dade Transit’s Metrorail system, opened to the public in 2012. 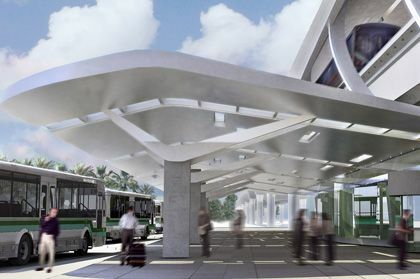 In 2014, the MIC’s16.5-acre Miami Central Station is scheduled to open as Miami-Dade County's first ground transportation hub, providing passengers connections to services such as: Miami-Dade Transit’s Metrobus; Tri-Rail, a heavy-rail system that serves Miami-Dade, Broward and Palm Beach counties; Amtrak; Greyhound; taxi and other forms of private transportation. The new Orange Line with service to Miami International Airport went live Saturday. Two service lines make up the 22-mile long Metrorail. The green line will run on the existing track. The new, orange line will run from Dadeland to Miami International Airport. It will branch off from the old track at the Earlington Heights Station. Riding the new line from the Earlington Heights Station to Miami International Airport takes approximately four minutes. 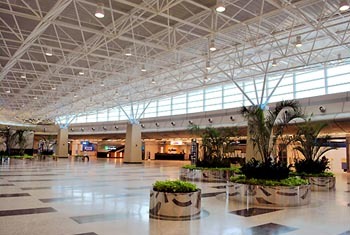 "The major factor here is ease and travel," said Marc Henderson with Miami International Airport. "That's one thing the airport is always concerned about. How easy is it for you to get to us and then get on the plane to go wherever you're going." Metrorail rides to MIA will cost $2 per trip and $4 per day for parking at the Metrorail lots. Tomorrow's grand opening of Metrorail service to the Miami Intermodal Center (MIC) will finally integrate Miami-Dade County's rapid-transit system with a transformed Miami International Airport (MIA) -- with much of that connectivity and modernized infrastructure constructed by Odebrecht USA and its Partners. Nearly three decades after Metrorail began heavy-rail operations in 1984, the "missing link" to MIA allows residents and tourists to board the system at any of its 22 downtown and suburban stations and be whisked to the intermodal center, adjacent to MIA, and then hop on the automated MIA Mover light-rail shuttle directly to the airport. The new Miami International Airport Metrorail Station and Orange Line Service is an elevated 2.4-mile spur built by a joint venture of Odebrecht and OHL at a cost of $360 million. "Moving people is what we are all about, and we have now reached the day when our passengers can move seamlessly between various forms of ground transportation, mass transit and air travel," said José Abreu, Director of the County's Aviation Department that operates MIA. The MIC is Greater Miami's "Grand Central Station." Constructed and managed by the Florida Department of Transportation, it is the southern terminus of South Florida's three-county Tri-Rail commuter train service, hosts MIA Metrorail Station and MIA Mover, and consolidates all of the airport's rental-car activities. The MIC will also be a central transfer point to Amtrak, Greyhound, tour buses and taxi cabs. 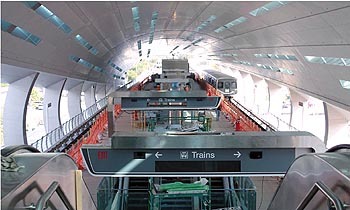 Odebrecht, with joint-venture partner Parsons, constructed the elevated 1.27-mile MIA Mover Automated People Mover System, linking the MIC with MIA, at a cost of $259 million. The free tram service commenced operations early last September. The MIA Mover alone has eliminated 1,400 rental-car shuttle trips to MIA every day, which reduced its carbon footprint by 157,000 tons of CO2 and saved the equivalent of 42,500 acres of pine trees -- a few of the features that allowed the project to achieve LEED Gold Certification by the U.S. Green Building Council. Finally, after a 28-year wait, Metrorail will reach Miami International Airport starting Saturday. Miami-Dade Transit will open the new Orange Line from Dadeland South Station in Kendall to the new airport station at the giant Miami Intermodal Center just east of the airport. It’ll be the first new Metrorail line since the elevated train system opened in 1984. “By opening this new line we will be connecting downtown and other areas to the leading economic engine of the county, the airport”, said MDT director Ysela Llort. • Direct Orange Line trains will run from Dadeland South to the new Miami International Airport station at the Miami Intermodal Center. • Passengers using the existing Green Line need to transfer to the Orange Line at Earlington Heights station. • You can park overnight and up to 30 days at three Metrorail stations: South Miami at 5949 Sunset Dr.; Okeechobee at 2005 W. Okeechobee Rd., and Earlington Heights at 2100 NW 41st St.Cost for parking at the three stations is $4 per day. Payment for long-term parking must be made in advance either on the Internet at https://transitstore.miamidade.gov or by calling the EASY Card Center at 786-469-5151 and using credit or debit cards. • Parking capacity at the three stations: South Miami, 1,774 spaces, Okeechobee, 1,180; Earlington Heights, 350. • Travel times to MIA from the three overnight-parking stations: South Miami, 23 minutes; Earlington Heights, four minutes, Okeechobee 14 minutes. • Trains will run seven days a week, 5 a.m.-midnight. • Plan your trip: Use free iPhone app Miami-Dade Transit Tracker; log onto the Miami-Dade Transit website www.miamidade.gov/transit, or call the 311 Miami-Dade information line in English, Spanish and Creole. 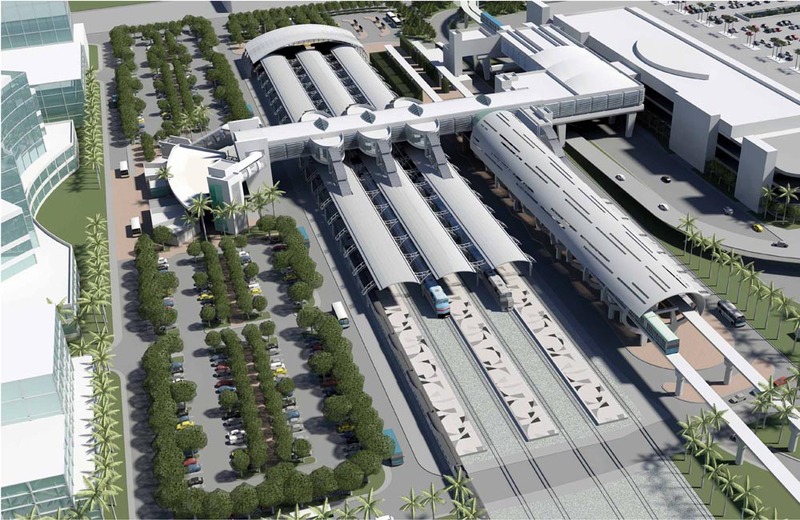 For the first time since it opened in 1984, Metrorail will add a new rail line that will link it to Miami International Airport.. Miami-Dade Transit will officially open its 23rd Metrorail station – the new Miami International Airport Station — Saturday, July 28. Trains serving Metrorail’s new Orange Line will take passengers to all stations between Dadeland South and Earlington Heights, continuing west towards the new MIA Station. Metrorail’s new service will make it possible for millions of Miami-Dade County residents, visitors and airport employees to have a reliable and seamless Metrorail connection to and from the airport’s MIA Mover. The 2.4-mile Metrorail extension to MIA, which runs parallel to State Road 112 and crosses the Miami River, is considered the centerpiece of the People’s Transportation Plan — the half-penny sales surtax approved by Miami-Dade voters in 2002. Construction of Metrorail’s extension and station were funded with $404.7 million from the PTP surtax and $101.3 million from the Florida Department of Transportation. More than three years after breaking ground, the Miami-Dade Metrorail link to Miami International Airport is to start carrying passengers July 28, officials said. The new 2.4-mile track to the airport is expected to shuttle 800,000 to 1.2 million passengers a year to and from the airport along the county Metrorail system. Called the Orange Line, the airport link, 23rd station on the Metrorail system, will operate from 5 a.m. to midnight seven days a week. The county operated test runs on the airport link June 28-29. Commuters can ride the Orange Line uninterrupted to the airport from Dadeland South heading north to the airport. However, commuters riding the Green Line south from the Palmetto, Hialeah, Northside, Dr. Martin Luther King Jr. and Brownsville stations must transfer to the Orange Line at the Earlington Heights station. Meanwhile, refurbishing of the 136-car Metrorail fleet, at a cost of $190 million, is underway and should be completed in 2019, according to report to the county commission by the People's Transportation Trust. The current fleet has been in service more than 20 years. The refurbished rail cars are to be fitted with state-of-the-art electronic equipment and high-tech materials, including a new diagnostic system that will allow train operators and maintenance personnel to locate and correct mechanical problems, according to county documents. For security, each rail car is to be fitted with a closed-circuit television system. Passengers were helping to test out the new ‘Orange Line’ that will run from Kendall to MIA’s station, which is opening in one month. For the first time since Metrorail opened 28 years ago, a new route was tested out Thursday from Dadeland South in Kendall to the Miami International Airport. The new service underwent a series of tests before the line officially opens to the public on July 28. Since Metrorail started in 1984, the system of elevated trains has operated on a single line that now stretches from Dadeland South in Kendall to Palmetto in northwest Miami-Dade, close to the Palmetto Expressway. But on Thursday, trains on a second line operated between Dadeland South and the airport. The tests will continue Friday. On July 28, the new route begin transporting passengers to the futuristic Metrorail airport station. When the airport line officially opens, passengers catching a plane will be able to carry their luggage on Metrorail. The Orange Line trains to MIA will operate every 10 minutes at peak hours and will travel from Dadeland South to MIA. There will be no Orange Line trains from the Palmetto station because the MDT did not build a spur connecting the existing line with the new track to the airport. The reason is that most passengers using the Metrorail travel from Dadeland South to Earlington Heights. Passengers who wish to travel from Palmetto to the airport will have to transfer at Earlington Heights. Near Miami International Airport, the Florida Department of Transportation is entering the final stage of the agency's most ambitious project in Miami-Dade County. Known as the Miami Intermodal Center, or MIC, the facility will make connections to public transit much smoother from one of the busiest airports in the nation. Construction on the Miami Central Station, the center of the $1.3 billion project, is already underway. If you're anything like Avi Tryson, you don't like what it costs to leave your car parked at the airport. "It'll be an extra 75 to 100 bucks for me to travel," Tryson said. By the end of the summer, however, everything is scheduled to change. "This is going to give people choices," said Albert Hernandez with Miami Dade Transit. 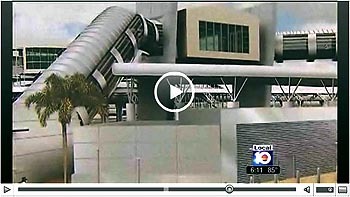 Hernandez gave Local 10's Sasha Andrade an exclusive look at the Miami Intermodal Station. "This is the end of the terminal station for a 2 1/2 mile stretch of our Metrorail system," he said. Once construction is completed this summer, you will be able to take the existing Metrorail from Dadeland, through downtown, and all the way to the Miami International airport. "We'll have two lines now," Hernandez said. "The green line which provides service to the Palmetto, and the orange line which will provide service to the airport." Miami’s first mass-transit rail directly linking Miami International Airport to downtown and the county’s outlying suburbs is about to start operating. With construction almost complete, the “AirportLink” Metrorail extension is scheduled for testing this spring and to start serving the public sometime this summer, said Miami- Dade Transit spokeswoman Karla Damian. The 2.4-mile elevated heavy rail extension will run from the new Miami Intermodal Center next to the airport to Metrorail’s Earlington Heights station. 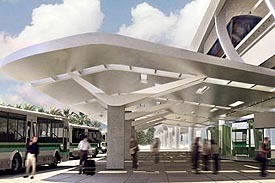 The new link means passengers will be able to travel to and from the airport and Metrorail’s 22 other stations that link Miami’s urban core and central business districts to surrounding communities such as Hialeah and Medley to the northwest and Coconut Grove, Coral Gables, South Miami and Kendall to the southwest. 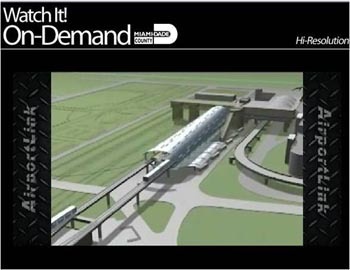 At the Intermodal Center, AirportLink will enable riders to connect to other train systems such as Amtrak intercity service, the South Florida commuter Tri-Rail and an “Automated People Mover” light rail to the airport’s terminals. AirportLink riders also will have access there to Greyhound and county buses, taxis and rental cars. A specific start date for the AirportLink line still needs to be set, Ms. Damian said. “We’re looking at how the testing goes, and we’re integrating new equipment to our existing equipment, so we need to be testing that, too,” she said. Miami Today -- As Colin Johnson and Oscar Romero stroll the construction site of Miami Central Station, which they say will be unlike anything in Florida mass transit, they point out all the modes of transportation that someday will come together there. They describe it as a modern Miami version of New York’s Grand Central Station. Where groundwater is now being pumped out into temporary pools will rise the central concourse that travelers will pass through as they head to and from nearby Miami International Airport and other destinations. A cement foundation and cinderblock walls near the middle of the 27-acre site are the beginnings of what someday will be a Greyhound Bus terminal. The beginnings of another building stand nearby. “That will be the police station and control center,” complete with bicycle storage and showers, said Mr. Johnson, the Florida Department of Transportation’s project manager. A future Amtrak station is sprouting up on the south end of the site. “We’re going to have all the tracks here,” Mr. Romero, a department consultant who is the senior project engineer, said about what currently is a dusty strip along the west side of the site where train tracks someday will stretch. John Mica, chairman of the powerful Transportation and Infrastructure Committee of the U.S. House of Representatives, toured the huge public transit center being built alongside Miami International Airport (MIA) on Monday, citing it as an example for other big cities that want to connect airlines, buses and trains, as well as other services. Among Mica’s guests for the tour of Miami Intermodal Center (MIC), an installation that is being built at a cost of $1.7 billion, were mayors and representatives from other states and cities interested in building similar transit centers. One of the most expensive and complex transportation projects currently under construction in South Florida will be finished this year: the Metrorail extension to Miami International Airport. The new line of the elevated train, from Earlington Heights Station to a new public transportation center under construction just east of the airport, will be in operation in the spring. It will be formally called AirportLink and is the first significant Metrorail extension since the system was inaugurated in 1984. 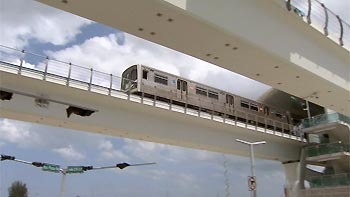 Scheduled to open in 2012, the 2.4 mile elevated Metrorail extension will provide a fast, reliable Metrorail connection to Miami International Airport for the millions of residents and visitors who travel to and from MIA every year. 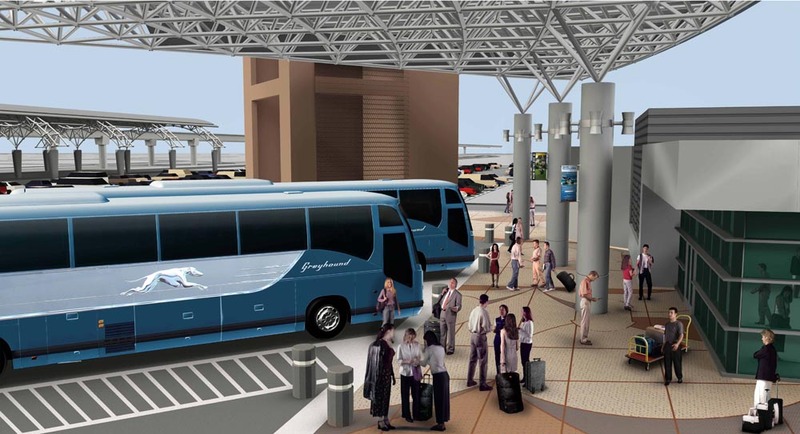 With this project, Miami-Dade County joins the ranks of other major cities with rapid transit connections to their airports. A major puzzle piece in the Miami Intermodal Center transportation hub broke ground Tuesday. 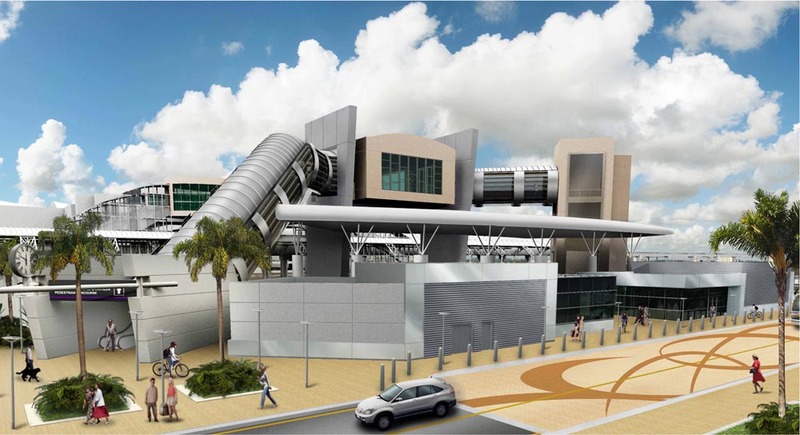 With its scheduled opening in Fall 2013, the Miami Central Station is planned to be the central transfer point for travelers using Miami International Airport, rail and bus services, TriRail and MetroMover, with connections to taxi and shuttle services. Construction begins Tuesday on the Miami Central Station, a major component of the Miami Intermodal Center, South Florida’s first ground transportation hub. Covering 16.5 acres, the $147 million Miami Central Station is a terminal scheduled to open in 2013 with access to various transportation services, including Amtrak and Tri-Rail, according to the project website. Metrorail will also connect to the station via the 2.4-mile AirportLink extension that is to be complete in April 2012.